Spoiler season is in full effect and Twitter is abuzz with the praises and condemnations of the masses. Preorder prices are being conjured from the aether and we’re left pondering whether or not we should be buying into the hype. Taking a look at the Magic Origins Planeswalkers has basically left me befuddled, I’m honestly having a hard time evaluating them in a vacuum because they’re templating is brand new to Magic. The best I can figure so far is to start with the creature, examine how easy it is to flip said creature, and then determine if the payoff was worth it. 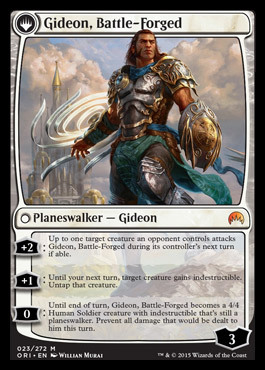 So Gideon starts like this, an obvious upgrade to Elite Vanguard. 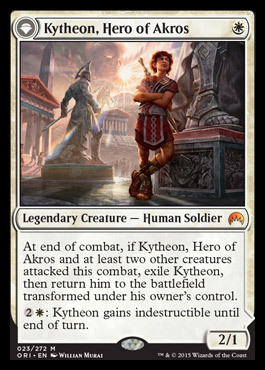 Kytheon slots into a white aggro deck pretty easily and transforms easier than most of the other walkers in this cycle. Currently we really only have a couple archetypes that this just slots right into: Abzan Aggro and the Heroic decks, the latter of which has fallen out of favor recently. The flip side of Gideon is more or less a mini impersonation of his previous incarnations. There is no “ultimate” ability so Gideon doesn’t force an opponent to care about his ticking clock but he does offer a variety of combat related tricks. Forcing an attack, making an unstoppable blocker, or wading into combat himself are all abilities that fit in a wide array of scenario. This card has a lot of flexibility. Problems: it requires you to overcommit to the board to flip, something that’s going to be even harder to do with black getting ANOTHER board wipe in Languish. So is this worth the $25 preorder price that SCG has slapped on it? I’m going to go with an emphatic “no” on that question. This is a conditional role-player in a sub-category of decks, likely a 2-of at most. Short term I see this card dropping into the $10-15 range quickly after release and ending up floating between $7-10 after that, relying heavily on casual appeal. The hardest thing going forward is evaluating how popular these characters are for casual players. Merfolk Looter has rarely been a constructed playable card. 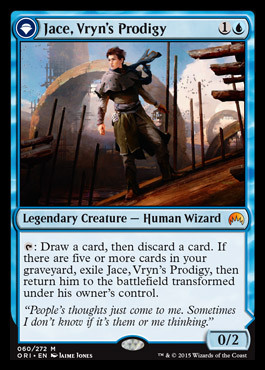 Even on sterroids, Magus of the Bazaar can’t make too strong of a case for looters being constructed viable cards so Jace isn’t starting off on the right foot . 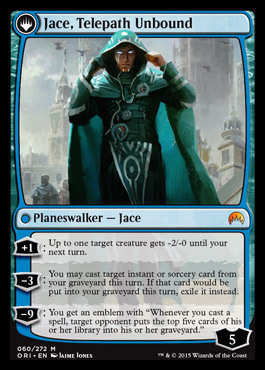 Is this a Jace you would put in a deck if you could “just cast” him? Probably not, so why would you want to jump through hoops to get to this? His “ultimate” provides the threat of defeat for your opponent without actually doing anything to hasten that defeat. Let’s put it another way, if you’re losing and you resolve this ultimate – you’re still losing. For a meager $19.99 preorder this could be yours, This card seems less playable than Jace, the Living Guildpact and that saw basically zero constructed play, so I have a hard time imaging a world where this one feels much better. I’m betting on this card being sub-$5 within a couple months. Just draw one side of a pyramid and you should be able to find Jace’s pricing trajectory. As purely a 2/3 lifelink for three mana, Liliana is a situationally playable card. Showing up to watch your other creatures die seems easy enough, though it might actually have the side effect of making some of your creatures unblockable. 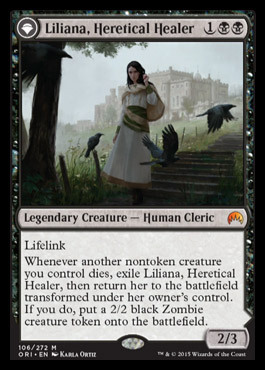 So Liliana’s starting off with potential, especially when you consider she starts off her Planeswalker career with a pet zombie. Once flipped you realize that Liliana is an awkward place for deckbuilding; she only brings back your own creatures to the battlefield and the only way to keep fueling that engine is to keep discarding cards. So by including Liliana, you’re painting yourself into a corner playing a deck that wants you to dump your hand and play tons of creatures so that you can awkwardly return them to play once they die. Mono-black humans seems like a place for Liliana, but is she any better than an Obelisk of Urd or a targeted removal spell in those decks? Liliana is often going to be an awkward scenario where you trade Liliana + another creature for a zombie + another creature, which is not exactly thrilling. The ultimate takes four turns to achieve and requires you to spend that time protecting Liliana, which is counter intuitive to the decks she would best fit into. This is another card with a preorder price of $24.99, a price that just can’t be sustained being such niche card. I expect Liliana to make a run at $10 and then slump from there as she sits buoyed by casual demand. Chandra is where things start getting interesting for me. Chandra is a pain to flip, but still easy at the same time. All you have to do is attack unblocked, cast a red spell, and then untap and tap again to that last point, of course this doesn’t take into account tricks like Titan’s Strength or Hammerhand that can push through that three damage pretty quickly. At this point Chandra becomes a ticking clock that’s going to ruin your opponent two points at a time. After three turns of this, there is very little reason to do anything other than pop the ultimate and ride out Chandra’s volcanic aspirations from there, This should leave your opponent dead in two turns or less. In a strange twist of fate, Chandra’s price tag is carrying some baggage. At an $11.99 preorder price it’s pretty clear that Chandra has a long history of being the Planeswalker that couldn’t and this price reflects it. 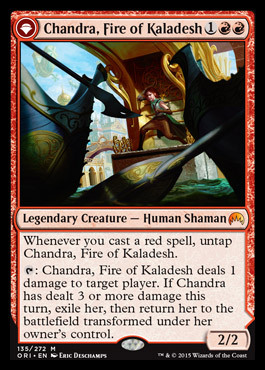 This seems like the easiest of the cycle so far to slot into existing decks without much hassle… I would almost call this price “reasonable” in comparison to the others, though I expect this card to settle closer to the $5-8 range because casual appeal for Chandra just hasn’t ever held her price very high. Nissa grants you an extra spell each turn for a number of turns until you get to alpha strike with six of your lands. Nissa does have the distinct advantage of her ultimate being capable of outright winning the turn it’s activated, the second ability is just “fine” in a pinch. Nissa’s biggest advantage is that she is a serviceable topdeck in the late game: you can cast, fetch a land, flip, and then draw another card off the top of your library immediately. If you need to squeak in the last couple points of damage you can instead activate the -2 ability to send a 4/4 rumbling into the red zone immediately. 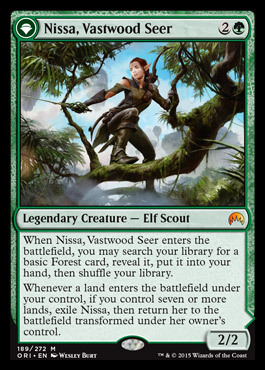 But is any of this realistically better than the existing Nissa? I can’t see why I would. Nissa is preordering for $19.99, a price that might seem reasonable if Nissa, Worldwaker wasn’t already under $14. When to cards occupy the same space, the price of the greater is going to put a ceiling on the price of the lesser and this seems like a compelling case for that. But then again, maybe people really just want a Borderland Ranger that only searches for basic forests. Is this card good? The design clearly wants to gut you of any advantage gained casting this card by giving your opponent the first chance to take advantage of the seven new cards. The first thing that came to many people’s minds was Quicken, or Leyline of Anticipation, but at that point is the setup worth the payoff? If you’re building a deck around it, you really have to build a deck around it. 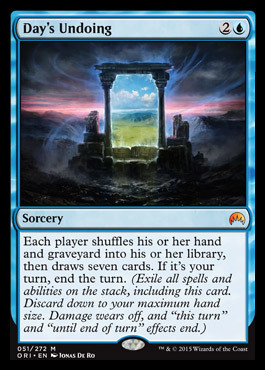 The idea being that Affinity could use this card to help them dump their hand and refill instantly… the debate erupted from every angle imaginable: Is this a playable card? Is this a valuable card? Is this a $5 card? No convincing of anyone was accomplished. So here’s how I’m approaching Day’s Undoing, I’m making a list and checking it twice. Maybe I’m a bit gunshy because I did preorder a playset of Time Reversals at $19.99 a piece, I have a soft spot for Timetwister effects. I love Timetwister so much that I refuse to build additional blue Commander decks unless I have additional Timetwisters to put into them. So I’ve clearly got mixed emotions regarding this card. Let’s just consider it in best case scenarios, in Standard what are you going to do with this card? Most likely candidate is a 1 or 2-of in a Blue/X control deck to refill late game, but is taking a random seven and reloading your opponent better than Dig Through Time? I just don’t see it. It’s just not a card I want to cast late game, regripping your opponent is just not where any deck wants to be. What about Modern? Three mana draw sevens scream “combo deck” but that whole “end the turn” part of resolving the spell sure doesn’t lend to any combos that I know. So that leaves us with a cute first turn by Affinity or teaming up with Notion Thief as our best options. Notion Thief is just a little too cute to be constructed viable, so let’s run with slotting it into that affinity list. Three copies? Two copies? What about those pesky Etched Champions and Master of Etherium? All of the sudden those expensive cards become a liability when we’re all-in on the low end of the curve, more Memnites please! So likely what we have is a card that has a lot of raw power but doesn’t necessarily have any immediate home outside of decks banking on being able to dump and reload. I’m guessing this card has to follow one of two paths: it struggles to find a home and slips quickly to $10 and descends slowly from there until someone finds a way to break it OR it “breaks” immediately and the formats simply adapt and the price begins its natural post-release descent. Either way this card is probably good for a $10 swing, I’m betting it swings south. The first wave of cards in this set have been unusually difficult to evaluate. I still have a sinking feeling that I am “just not getting” something about the new Planeswalkers, but for the most part they seem like garbage to me. Day’s Undoing is another one that simultaneously gives me a million ideas, all of them sketchy at best… but it only takes one. I’d much rather avoid the risk on a card like Day’s Undoing in favor of more predictable targets. Oh and this guy at $40? Come on guys, you can’t be serious. To be honest, I don’t disagree with everything, it was just a sarcastic comment in light of the recent events where he got bad-mouthed a lot. I do disagree with Kytheon being only sought after by casuals, because I kind of believe in a renaissance of White Weeny, but that’s just me. I don’t care about Jace, Nissa or Liliana either and with Chandra I am pretty much on the same page. I think that Day’s Undoing CAN be broken (and not only if you play it with Quicken…) in Affinity, Burn or to a lesser extent Control decks (having about 6 lands, but not much in hand anymore, tap for three and don’t mind the end of the turn, as you are probably Draw-Go anyways). So Funquan, you are buying the new Jace and Gideon at $20 and $25 respectively? Interesting. Thanks for your civil disagreement sir! One thing I noticed about Kytheon is that it doesn’t mention anything about dieing being a stipulation. So does that mean the effect will still trigger even if he dies in combat? So the way the rules work with this is it’s going to be a trigger at the end of combat, if Kytheon has died before then that trigger will not occur. Shadray I believe that if Kytheon dies in combat he dies :p For real tho, if he is dealt lethal damage he will go to the graveyard before the end of combat and not flip. 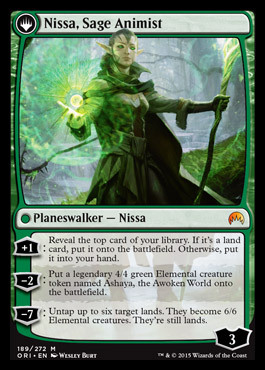 The green X spell might have changed my evaluation of Nissa a little, but it wasn’t spoiled until after I submitted my article… so timed that one wrong by giving me editor more time to look over the article. As far as exploit goes, is there anything outside of Sidisi that we would even want to play that has exploit? 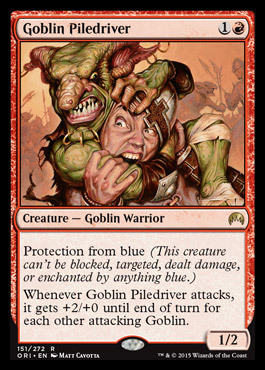 I could see maybe the Fleshbag Marauder, but even that seems like jumping through a lot of hoops to flip a planeswalker that is not that great once flipped. I know you couldn’t have known the green X spell was on the way, no one knows everything ;-p. I agree the exploit creatures lack some luster, but Sidisi’s Faithful is a single blue Exploit Unsummon…you could cast that with 2-3 mana up flipping lili and bouncing a creature, then plusing the flipped Lili (possibly making the opponent discard that creature if they were hellbent), or have countermagic or removal up, or minusing to bring Faithful back and bounce a second creature. That’s potentially a whole lot of tempo advantage. Vulturous Aven becomes mildly playable as an exploit target, but Sidisi’s Faithful seems like it would make for a smart inclusion. I just think there’s more potential without as much work as people believe. And running Lili along with Cruise and/or Dig would seem like a no brainer with the +2 discard ability. I guess I just like this Liliana as a walker much better than most…or I’m undervaluing the -2 of LotV too much.